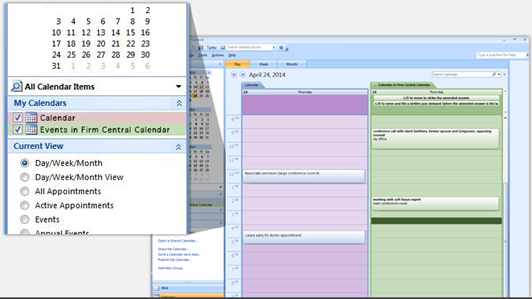 It’s now possible to sync legal calendar events in your Firm Central calendar to Outlook and create Firm Central events in Outlook, making your practice management solution even more effective. To display your Firm Central calendar in Outlook, select Events in Firm Central Calendar under My Calendars. Please note that events created in your standard Outlook Calendar will not be automatically added to your Events in Firm Central Calendar view. To add a new event, simply double-click the time that you’d like the event to begin and complete the required fields. 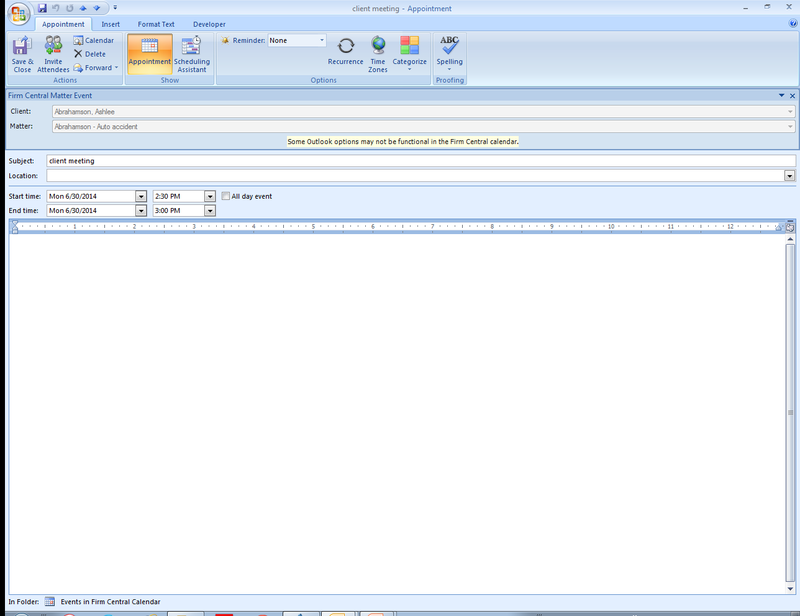 Note that each event created in Outlook must be associated to a Firm Central Client and Matter using the drop down menus. To edit an existing event, simply double-click the event in the calendar view and modify the date/time/location information. Events created or edited in Outlook will be automatically updated in the web version of Firm Central. 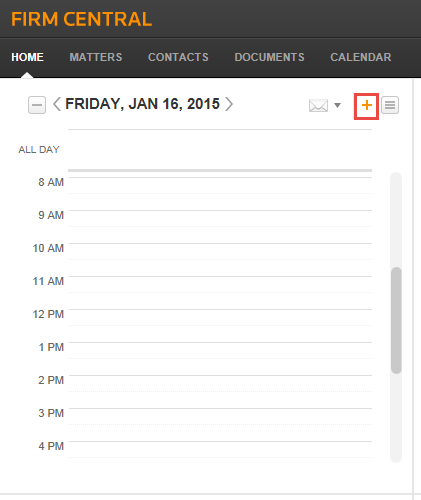 Create matter events using the Firm Central home page calendar using the orange plus sign or on the global calendar or a matter calendar if you have owner or editor permission on the matter using the New Matter Event button. To edit an existing event that you’ve created, simply double-click the event in the calendar view and modify the date/time/location information. Events created or edited in the web version of Firm Central will be updated in Outlook. Please note that changes made in Firm Central on the web may take up to 15 minutes to be reflected in Outlook.